My partner and I have had Chris do a number of jobs for us over the years, in our previous property he installed a brand new kitchen and did various other upgrades around the flat offering solid advice and valuable expertise in order for us to utilise our property to its full potential... We believe that due to his excellent workmanship we did really well in the sale of our flat. When we bought our present home we had no hesitation in contacting him to work on our new property. Work included a new extended bathroom, new doors fittings facings, two velux bedroom windows and outside work All the work Chris carried out was to the highest standard, he was reliable and friendly and we would highly recommend him to family and friends and have indeed done so, and just to add that Chris was honest and upfront which was very refreshing. Would thoroughly recommend Chris McKenzie. Chris McKenzie crafted, fitted and installed a series of sliding drawers to make the most of our under stair space. He also widened the hatch to our loft area and installed a folding ladder. Chris McKenzie was diligent, curtious and thoughtful towards our often chaotic household. The quality of his work is excellent, as was his attitude towards us. For the skill and quality shown in his work his prices were more than fair. We cannot recommend him highly enough. Chris has been working on soundproofing against a persistently noisy neighbour who wakes us up through the night and has been working from the loft down to help overcome the problem. Each time Chris completes the job there is a noticeable effect on noise reduction. The photos of our loft space and bedrooms demonstrate the lengths Chris has gone to help us get a good night's sleep and we are confident that after he has sound-proofed our entire adjoining walls we shall be sleeping like babies! He is an exceptionally gifted joiner who takes great pride in his work and we love his happy, nothings too much trouble manner. The materials and waste are delivered/taken away in his van and he leaves no mess. A pleasure to have working around the house and we highly recommend him. I had the chance to employ Chris twice within the past one year first to replace my front and rear door and second to replace my garage roof along with replacing the door and windows. Chris is a professional who is thorough in his job he made sure the measurement were taken twice before order and also suggested the best door that would be good as well as value for money thus reducing our cost to purchase for the doors and windows. Chris came to our house in the promised time and made sure the work was completed in the agreed time. Also after fitment I noticed that one of the double glazing was damaged, Chris came checked and immediately contacted the supplier ordered a new door and refitted it for us in a quick turnaround. Finally is finishing skills are exceptional, he makes sure the finished job looks completed and tidied up the job location and left. His cost was reasonable considering his quality of workmanship, time keeping and above all after care. I cannot recommend Chris enough. 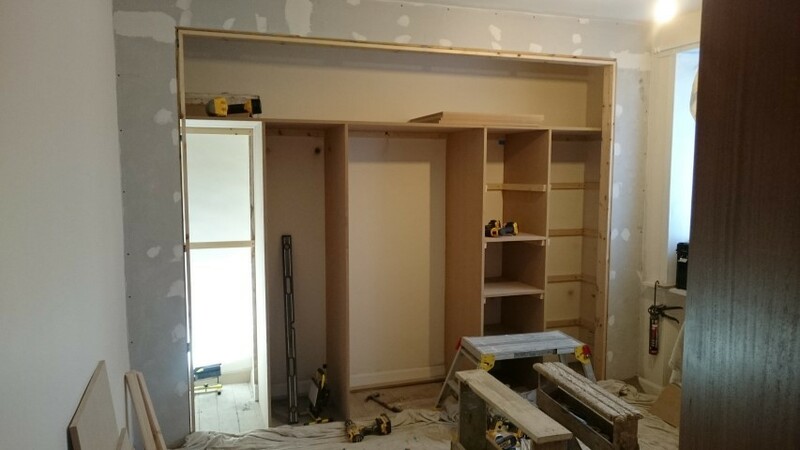 Chris McKenzie Joinery and Building Contactor's designed and constructed a bespoke built in wardrobe for my bedroom. The service Chris provided from initial phone call right the way through to the completed project was beyond even what I was expecting, having already heard glowing reports on service, quality of workmanship and professionalism. Simply put - If you want a quality service from a reliable tradesman with exceptional standards of workmanship then I highly recommend Chris McKenzie Joinery and Building Contactor's.